EACH year, on the Fifth of November, the town of Lewes is filled not with the sound and smell of traffic, but the beat of drum, the blast of trumpet and the smell of powder and burning torches. The streets are thronged with people in festive mood who have gathered expectantly to see a spectacle unsurpassed in the rest of England. As the Bonfire Societies parade through the streets, their members bedecked in magnificent costumes, the spectators stand entranced by the splendour and pageantry of the occasion. There will also be those who wonder why. All people have their special days when events from the past are celebrated in some traditional way. We of the Cliffe Bonfire Society hold our celebrations of remembrance in light hearted vein, but do not allow this to distract us from the fundamental reasons for our celebrations. By our activities on the 'Fifth', we desire to remind people of the religious antagonisms of a bygone age and in particular, to spotlight specific events which were the outcome. it shone on Beachy Head. those twinkling points of fire. calling England to withstand the Spanish Armada bearing officers and instruments of the'Holy Inquisition'. And by 'The Fifth' we remember the discovery on 5th November 1605 of the Jesuit-inspired Gunpowder Plot to destroy England's Protestant King and Parliament. No less important, the landing at Brixham on 5th November 1688 of William, Prince of Orange, who gave England freedom of worship for Anglican and Non-Conformists alike and established the roots of that British tradition of tolerance and understanding which sets an example to all nations. Many, doubtless, forget the lessons of the past, but in the Cliffe Bonfire Society our desire in our annual commemorations is to recall the struggles, triumphs and deliverances of times gone by - lest we too forget. Pope through the streets, finally late at night, to commit it to the flames. 1723 An old churchwarden's account book has an entry as follows: 'Nov. ye 5th. Item: Pd. ye ringers being ye day of Deliverance from ye powder plott . .
1829 The dragging of lighted tar barrels through the streets was introduced. 1842 Bands were introduced in the Processions. among many of its respectable inhabitants. near Keere Street and ambushed some of the 'Boys', who were arrested. made to carry out the celebrations on the Wallands Fields. 1853 Bonfire Boys organise themselves into processions. The first societies thus formed were those of the'Cliffe'and'Town'. 1856 A feature of the demonstrations introduced by the Cliffe was the 'Lord Bishop'who 'officiated'. He wore full clerical uniform and gave a 'sermon' before the effigies were burnt. 1858 The Society was unfortunate when one of its members made off with the money box. He was commemorated the following year by being burnt in effigy along with the Pope. 1874 An epidemic of typhoid in Lewes. The postponed celebration was carried out on the night of December 31st, after a fall of snow which greatly added to the effect. 1904 A large fire in the town a month before the fifth showed the inhabitants the danger of fire, and consequently the famous Lewes Rouser firework was prohibited. 1906 Fires in the Streets and the dragging of lighted tar barrels through the streets suppressed. 130 police were on duty in the town and many people were arrested including four leading Bonfire Boys. In the ensuing court case they were acquitted of instigating the forming of a bonfire in Commercial Square. 1914-18 Activities suspended during World War 1.
tradition of burning a papal effigy. 1939-1945 Activities suspended during World War 11. Cliffe featured in American 'Time' magazine. Press and radio coverage increasing. 1960 Celebrations suspended owing to severe flooding in the town. 1964 The Society took an active part in the town celebrations to mark the 700th anniversary of the Battle of Lewes. 1972 Cliffe rejoins the Bonfire Council. 1973 Cliffe goes into Europe. The Society took part in celebrations in the twin town of Blois, France. 1974 The Bonfire Societies stage a Pageant of Bonfire History as part of the Festival of Lewes. 1977 The Bonfire Societies organise processions and fireworks to celebrate the Queen's Silver Jubilee. 1978 Lewes Bonfire televised - some television coverage in most subsequent years. 1980 The Society leases some land and builds its own workshops and storage facilities. Adverse publicity concerning the burning of the Effigy of Pope Paul V forces Ministry of Defence to ban Military Bands from Cliffe processions. 1981 The Bonfire Societies stage a firework display for the Lewes Mayoral centenary. 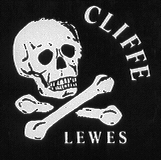 1983 The Cliffe successfully applies to the Registry of Friendly Societies to become CLIFFE BONFIRE SOCIETY LIMITED. 1988 The Lewes Societies stage a firework display on the battlements of Lewes Castle to celebrate anniversary of Spanish Armada. After nearly 40 years at their Mill Road Firesite, the Society were forced to find a new site at Brooks Road, Lewes. 1989 Mr Bob Allen, a Life Member since 1969, and Secretary of the Society for 25 years, passed away in December. The Society purchased a seat in his memory for the new shopping precinct in Cliffe High Street. 1990 The Cliffe charges admission to the Firesite for the first time. 1975 Arab Nationalists and buyers-up.